Justice League-al Powerhouse Teams | Pinoy Alert ! In the real world, we can see the battle occurring. We are either on the front-line, or we can see and hear it through the media – radio, newspapers, television, computer, and periodicals. This democratic freedom we are enjoying allows us to be more involved and active in our quest for ideals: social equality, justice not-delayed, fair distribution of rights and privileges, etc. But be careful in the paths that we choose to tread, and likewise be extremely cautious of whose sides to take or join forces with, for unlike in video games where we could have more than one life to spare, the real world offers us only one lifetime to either waste or make sense. The war is about to begin, but who will win? Supreme Court (SC) Chief Justice Renato Corona has put together a powerhouse legal team composed of only the best lawyers of the land. Former chairman of the INC’s New Era University. One of the private prosecutors at the impeachment trial of former president Joseph Ejercito Estrada. One of Corona’s fraternity brothers at the Ateneo’s Fraternal Order of Utopia. 4. Jose “Judd” Roy III. Former dean of the Pamantansan ng Lungsod ng Maynila law school. The four I consider as the “Four Horsemen of the Apocalypse” as per Bible characters. The four lawyers do seem like the four beings that ride out on white, red, black, and pale horses. The four riders are commonly seen as symbolizing Conquest, War, Famine and Death, respectively. …and those exactly are the repercussions we might experience if Corona’s legal team win. Principal proprietor, Law Office of Ernesto B. Francisco Jr.
Director and corporate secretary of Hereaus Electronic Materials Philippines, Inc., Casa Cebuana, Inc., Cebu Figueroa Estate Corporation and Coco Properties, inc. Compliance officer with a rank of vice president and corporate secretary of Medical Doctors, Inc., the company which controls and manages the Makati Medical Center Hospital. The House of Representatives has in turn constituted the team that will prosecute Corona in his Senate impeachment trial. Speaker Feliciano Belmonte Jr. said that he has asked House prosecutors to thoroughly prepare for their job and “present the best possible case that we can” in the impeachment trial of Chief Justice Renato Corona. Belmonte said he will consult with the prosecution team if the House would have to elect more prosecutors as the impeachment trial moves along. “We will make available a budget of not more than P5 million for them so they can get the help they want,” he said. Belmonte, who managed the prosecution in then President Joseph Estrada’s Senate impeachment trial in 2001, recalled that then Speaker Arnulfo Fuentebella provided his team with a P5-million budget. 8. Arlene Bag-ao of Akbayan. Two will serve as alternate prosecutors. 14. Lawyer Mario Luza Bautista has accepted the offer to be the lead private prosecutor. Lawyer Mario Luza Bautista made his debut on national TV during Estrada’s impeachment trial from December 2000 to January 2001. As a private prosecutor, Bautista drew out the testimony of Equitable Bank vice-president Clarissa Ocampo on Estrada’s alleged multimillion-peso secret bank accounts. Majority Leader Neptali Gonzales II of mandaluyong said Tupas, Chairman of the Committee on Justice that drafted the impeachment complaint, heads the prosecution team. Gonzales said Tupas and his colleagues would decide if they have to hire additional private prosecutors. “The team would now have to prepare for the task ahead by studying the evidence and interviewing witnesses,” he added. 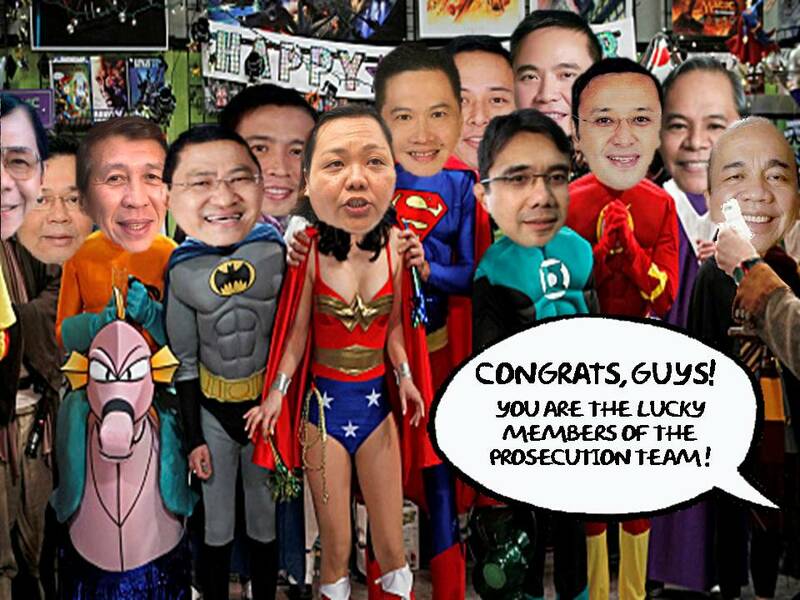 The Prosecution team is like the superhero team Justice League – each with his rightful skills and abilities, all banded together for one common cause. The list of names from both teams are not yet final and complete. They may still add, remove or change their team members as developments arise. One thing is certain: I will be in close watch on all the updates, and will not dare miss this history in the making. Corona was impeached based on three grounds — culpable violation of the Constitution, betrayal of public trust, and graft and corruption. Corona’s trial will begin in January. 1) Partiality anf subservience in cases involving the Arroyo administration from the time he was appointed as associate justice to the time of his midnight appoinment as chief justice. 3) Failure to meet and observe the stringent standards under the Constitution that provided that a member of the judiciary must be a person of proven competence, integrity, probity, and independence in allowing the Supreme Court to act on mere letters filed by a counsel which caused the issuance of flip-flopping decisions in final and executory cases; in creating an excessive entanglement with Mrs. Arroyo through her appointment of his wife to office; and in discussing with litigants cases pending in the Supreme Court. 4) Blatant disregard of the principle of separation of powers by issuing a status quo ante order against the House of Representatives in the case concerning the impeachment of then Ombudsman Merceditas Gutierrez. 6)Arrogating unto himself, and to a committee he created, the authority and jurisdiction to improperly investigate an alleged erring member of the Supreme Court for the purpose of exculpating him. 7) Partiality in granting a temporary restraining order in favor of Arroyo and her husband Jose Miguel Arroyo in order to give them an opportunity to escape prosecution and to frustrate the ends of justice, and in distorting the Supreme Court decision on the effectivity of the TRO in view of a clear failure to comply with the conditions of the Supreme Court’s own TRO. 8) Failure and refusal to account for the Judiciary Development Fund and Special Allowance for the Judiciary collections. Now that you learn some information about the impending grand battle, I hope you will use them to fight off the “devil” and become a champion. It’s a cold, dark world out there, but we can shed some light and win the lost to Christ. Jesus said “harvest is plenty, but the laborers are few” (Matthew 9.37). After all since Jesus is the light of the world and we are in Him that would make us a little light. Be of good courage. If we continue to fight in spiritual warfare, we will endure to the end. Why? We are more than conquerors in Christ Jesus because we have His power and His Spirit. Previous Metro Manila Film Festival 2011 Next Goodbye Gloria! lawyer, quiet and a humble person. All for the best, good luck to both parties and may Truth and Justice prevail! More power to you Sir and God Bless! Thanks and I appreciate your comments….I believe everyone is really after the truth, and to prosecute those that took advantage of their authority. The Arroyo administration had several issues that definitely needs closure. I am glad the Aquino administration is not into a “compromising” agreement with these “professional crooks”. I just hope PNoy would not neglect his other duties for the nation.